I don't think my brain is really decaying, but the crazy stuff I did this week could make a case that it is! On Tuesday Jane and I went to a local pool and I forgot to bring towels! It was hot enough that we drip dried to get back into clothes. But the changing room/bathroom was so gross I'm still traumatized. As an aside, the pool was less exciting than expected. It was also unshaded and shallow. The water was as warm as bath water, so not refreshing at all. I was the only adult there, save the lifeguards who seemed to be all teenagers or early 20s. It was only $2.50 to swim, and not SO far away, but it's not in the best part of town -- you can see the Interstate while you're in the water. The pool closed this weekend, so we went the last week possible. Who ever heard of summer ending in July?! It's going to be 90+ here for at least another six weeks! We've got to figure out some better way to go swimming next summer (or the rest of this one!). Maybe join the Y? Forgetting the towels actually seems minor compared to what I did next. When we got home my computer wouldn't turn on. It just stayed black, although sometimes the Dell start screen would come up. Eventually I got to an error screen, and it gave me the option to restart, shut down, etc. I tried both and still wouldn't turn on. Finally it said "want to refresh?" I was desperate and upset and didn't read closely. YES, just turn on. It refreshed and wiped out all programs that had been installed. That meant Office, Creative Suite and a ton of other things. Shawn came home, was baffled that I would do such a thing but a big help and spent a couple hours reinstalling. Even though he was in the middle of a big work project, and I was a big freak out mess. The computer is almost back to normal. There are a few programs that still need to be installed -- backup systems and such. I am trying to go more slowly and THINK through, and I'm glad that these two brain blips didn't have lasting consequences other than my annoyance and some time. The Bad: Still plenty of bounce (if you know what I mean). The classes varied by instructor. The main teacher missed a couple classes, and the subs were much more by-the-seat-of-their-pants, so on those days it was less of a good workout. 45 minutes at a time is a little longer than I usually workout with videos at home, although I'm trying to increase my time investment when I can. And when we did lots of cardio with strength training against the water resistance I could really "feel the burn," so to speak. My muscles were never that sore (I've got aching thighs today from lots of land-based squats, so I know sore!). But it felt great and I certainly sweated a lot, all while staying cool in the pool. Highly recommend, and I wish I could find an affordable class to take this fall. It is hot here until October! 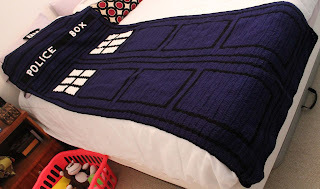 I made this blanket following this Blue Police Box pattern from Sandra Petit. It makes a really tall/skinny throw, and I think adding some background to keep the finished product rectangular and a little wider would be a good idea. The light at the top seems off to me too, and a background edging or something would fix that right up. Otherwise maybe leaving out a few of the rows in each box to make it a little less tall and seem more properly proportioned. 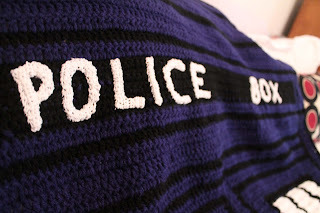 I added Moogly alphabet letters for the POLICE BOX part - I can’t cross stitch very well. I used cotton thread and a small hook to make the letters to fit. I used a darker blue than suggested in the pattern (mainly because it’s what I had on hand to start with.) All of the worsted weight yarn is Red Heart, and the white thread is something I had on hand that no longer has a label. 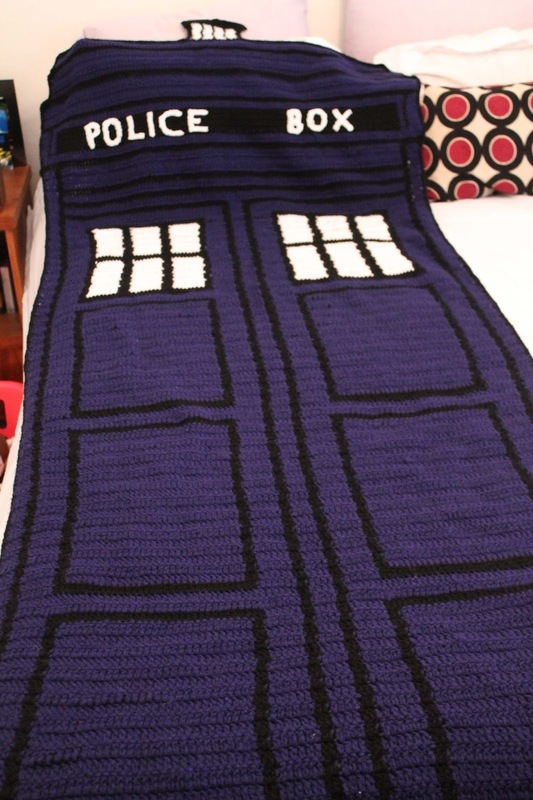 It took me a few months to finish, mainly because of the monotony of double crochets so I would put it down for a while. 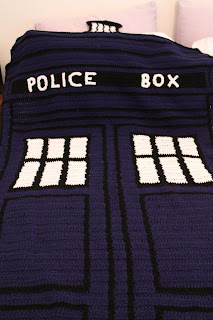 I also had trouble keeping the yarn tangle-free, especially in the "window" sections, when I had three colors going. 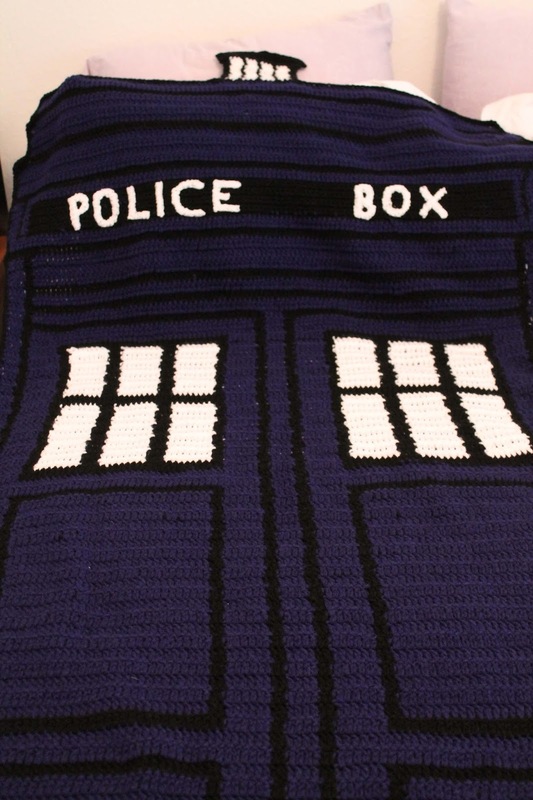 I did not cut yarn at every change, so the blanket is probably even thicker than normal because of carrying yarn on almost every stitch. 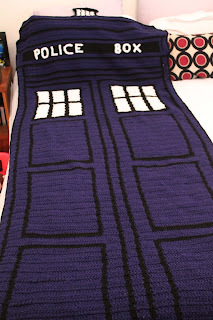 When I finally give it to Gingie (it's a present for my mom) I think she will like it! I did tell her it was done and showed her a picture of it before I wrote this post. We read Jane 1,000 books this summer. Starting in mid-March our library began a program called "1,000 Books Before Kindergarten," in an effort to get parents to read more to their kids. We signed up and didn't change our reading habits, other than writing down every-single-book as we read them. We finished up in late June, so 1,000 books in less than four months. Woah. Extrapolating we are probably averaging 3,000 books per year, so we should definitely read 10,000 books before she actually starts Kindergarten (in two years). She loves books -- not sure if it's because we've always read to her or if it just worked out that way. She wasn't the first kid to complete the log -- not by a long shot. Some people with younger kids were able to finish 1,000 books in two months or so. That makes sense, as board books tend to have less than 20 words in them! That will definitely rack up the titles quickly. We read a mix of book lengths, although I think most tended toward longer picture books and a few "readers" (which usually have fewer words than picture books). Sometimes a board book would sneak in too, although they aren't her favorites anymore. Here are some book series we have loved: Ladybug Girl, Fancy Nancy, Pinkalicious, Amelia Bedelia and Freckleface Strawberry. I'm always looking for more strong female character books. Jane also loves Arthur, Curious George, Thomas the Tank Engine and Franklin books. (Not girl characters but still good stories.) Oh and George and Martha books are the BEST. I wish there were more of them, and I want to get Jane the complete set of her own, although we've checked out the library's copies at least three times each. So good -- not too long and charmingly goofy. The prizes for our hard work were a drawstring backpack (at 250 books read), a decal/sticker (at 500 books read), a poster (at 750 books read) and a book (at 1000 books read). She also got her picture on the library's kid Facebook page as having completed the program. Apparently there will also be a party for all who finish, but they haven't decided when that will be.